Oh, Christchurch. How my heart aches for you. I was working at home that Tuesday, up to my ears in bank reconciliations and BAS forms and oblivious to what was going on outside the four walls of my office. It was early afternoon when my mobile phone suddenly beeped. The message was from a close friend saying she hoped my ‘family in New Zealand were all okay after the earthquake.’ Say what? Trying to ignore the chill that began to curl in the pit of my stomach, I immediately turned on the TV but nothing could have prepared me for what I saw on the screen. 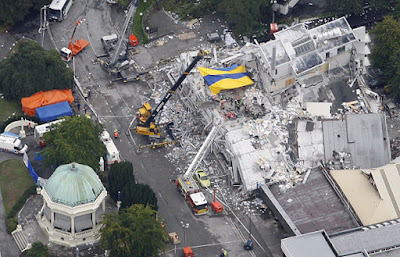 Christchurch was haemorrhaging. Buildings had been reduced to piles of twisted metal, broken concrete and shattered glass. Direct feed live television didn’t disguise the stark violence of the carnage – whole facades of buildings reduced to rubble in the streets, dust and smoke hanging in the air, parked cars pancaked by walls of bricks falling from above. 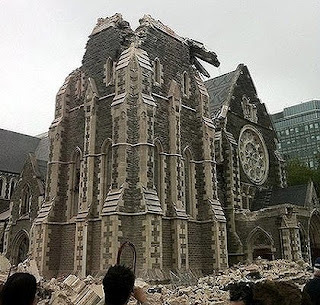 But when I saw Christ Church Cathedral minus its spire in ruins on the ground, the tears began to fall. As I struggled to comprehend what I was seeing, the images kept on coming, graphic, unrelenting and brutal in their clarity. There’s a cliché every media outlet has used a lot this week, but only because it’s true – it did look like a war zone. People were walking past in torn and bloody clothes, shocked and/or crying, holding on to each other perhaps in an attempt to anchor themselves to something, anything. A woman stumbled by with blood streaming down her face. She looked utterly terrified. I hate to think what she went through before the camera lens caught her on film. The unavoidable realisation stuck like a lump in my throat. Deaths - a LOT of them – would be an absolute certainty. It was impossible to come to any other conclusion after watching that footage. I felt sick. My shaking hand reached for the phone and dialled my mother’s number within seconds. My aunt and uncle, R & P, live in Christchurch, as do many of my friends. Mum had no news. I could hear the fear of the unknown catch in her voice as she told me she’d tried to get through via email, text and phone but without any luck. I felt a million miles away and totally helpless. We both tried to put a on brave front because the alternative was simply too hard to even consider. Fortunately we were the lucky ones - a very anxious 30 hours later with not a lot of sleep, news arrived (via Facebook of all places!) that R & P were shaken, but both OKAY. The relief was palpable. The next day brought more good news I’d been praying for - all my Christchurch friends were safe and well too, thank God. But the news won’t be good for everyone. Already there are families trying to deal with grief too awful to imagine, and more will follow in the days and weeks to come for those families of the still missing. They're living in what must be a hellish limbo, hoping against hope for another miracle to appear out of the rubble. How tough it must also be for those heroes (and they ARE heroes, in every sense of the word) who form part of the rescue and recovery teams from all over the world, the medical staff, the police force and fire brigades. Even though this is something they train for, I don’t for one moment think it makes it any easier for them when a life is unable to be saved. The hardest part of any disaster is the loss measured in human casualties and this tragedy will be no different. Yet this one is more personal and harder-hitting for me because I know this city and its people; I’ve shopped in the Cashel Street Mall and I’ve eaten lunch in the glorious outdoor surrounds of Cathedral Square; I’ve biked along suburban streets in Riccarton where my grandmother used to live and I’ve walked along the banks of the Avon River. Christchurch is a part of me, and a part of my own history. Which is why I mourn for Christchurch, along with so many others. We feel your pain, your loss and your unbearable sorrows. We will always remember the city of old and we’ll be there to help you rebuild and begin anew. Because you will again rise up; you will again be beautiful. I’ll leave you with this little excerpt from New Zealand’s Prime Minister John Key’s speech to the people of Christchurch. Inspiring words that speak from the hearts of us all. ‘Though your buildings are broken, your streets awash, and your hearts are aching, your great spirit will overcome. While nature has taken much from you, it cannot take your survivor's spirit. This devastating event marks the beginning of a long journey for your city. It will be a journey that leads from ruins and despair to hope and new opportunities. From great hardship, will come great strength. It will be a difficult journey, but progress is certain. Things will get better. 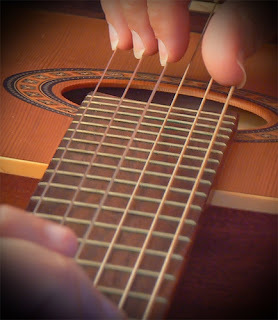 One of my neighbours plays the guitar. Beautiful, lilting, sing-to-your-inner-soul kind of guitar. I was hanging out another basket of washing on the clothes line today (it is a rare day that I don't hang out at least TWO baskets) and had the very good fortune to be treated to the magical sound of classical guitar float over our back fence. For a second or two, I thought it was someone playing a CD but on a closer listen, I realised that it was someone simply letting the music within decide where their fingers were going. Gosh, they were good - I could've listened to them play for ages (except by then I would have had sunburn as it was still around 35 degrees outside) - and although it possibly may have been because of the unbelievable heat, I also enjoyed the little journey my mind began to take, the music conjuring up pictures of me, relaxation and a long, cool drink, reclining on the sparkling sands of somewhere exotic. *smiles* Oh yeah. I'm not exactly sure which particular house this talented musician lives in, and to be honest I don't actually need to know. Sometimes, a little mystery is good, right? All I know is that as long as they keep on playing, I'll be quite happy.